Missing in action is RIM’s BlackBerry and, less surprising, Apple’s iPhone and iPod touch devices. Apple’s official line has always been that the full version of Flash player – not the underpowered and less well supported Flash Lite – is too processor intensive to run properly on a smartphone, leading to a significant drain on battery life. However, with the new iPhone 3GS (the “S” stands for speed) that would appear to be less on an issue. 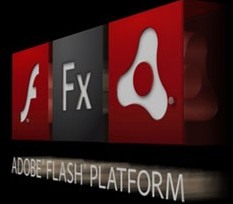 Instead, as we all should know by now, the real reason why Apple doesn’t want to embrace Adobe’s Flash is that it would offer third-party developers an alternative “runtime” on which to develop and, perhaps more importantly, distrubute apps for the iPhone, bypassing Apple’s control (and that of its partner carriers) and the iTunes App Store itself. And we can’t have that, can we? Instead, it’s been reported that Apple may be planning to add support for Flash video in particular through an update to the iPhone’s version of Apple’s QuickTime. As for why RIM hasn’t jumped on board, well that’s anybody’s guess, although I’d suggest that making a decent web browser for BlackBerry – you know, one that renders HTML properly – should be a priority for RIM over adding the bells and whistles of Flash.